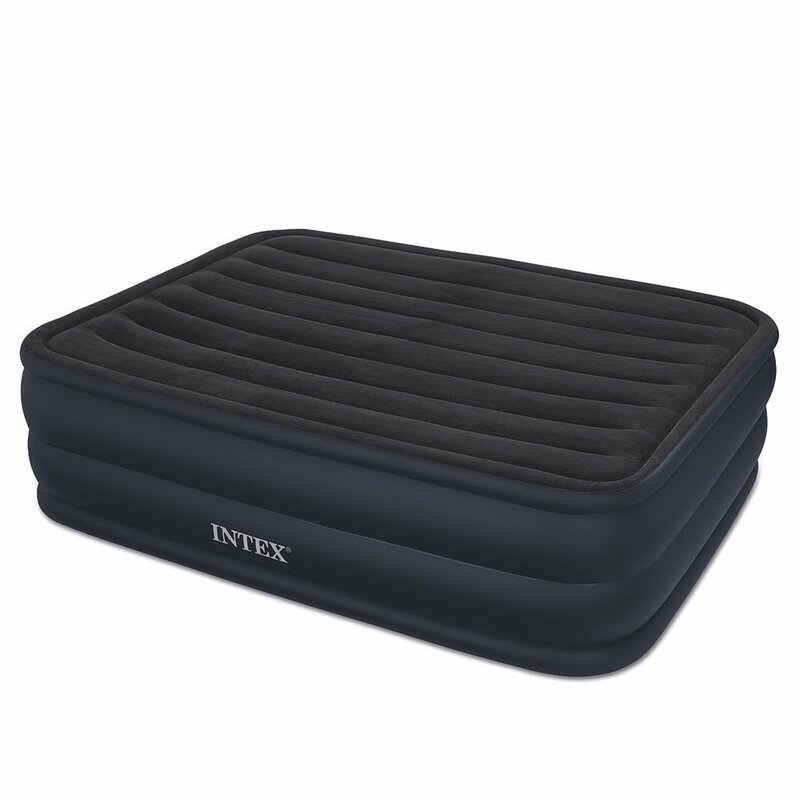 The Intex Raised Downy Airbed with Built-in Electric Pump is popular and preferred choice of people who wish to keep an additional bed in stock for unexpected guests or emergency travelling. Note: Let me give you full clarity before moving ahead with detailed review. Even though this mattress is not for daily use but if you want to have an additional last minute sleeping option handy but you don’t wish to spend big money on it, then there is no better option than Intex raised downy airbed. Yes, it is single motor inexpensive air mattress and you can gamble with this option if you just need for a matter of few days every month. 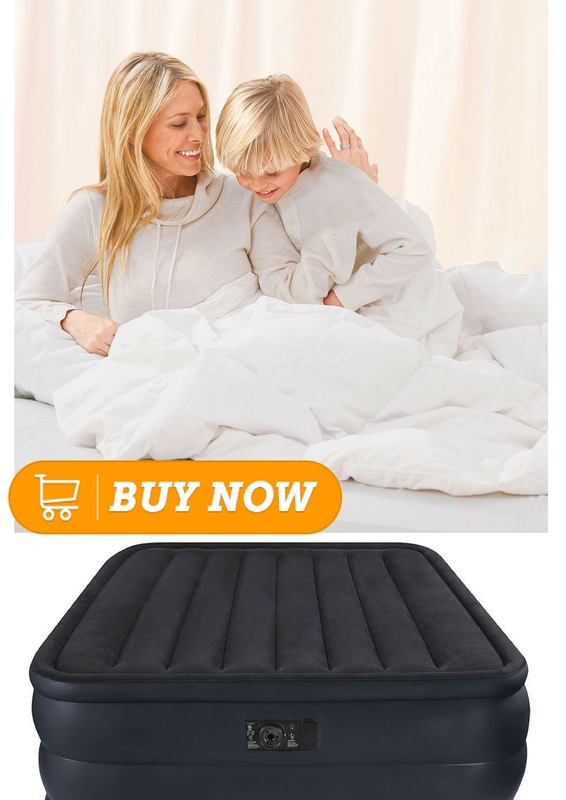 Whereas, if you are looking for a daily use mattress then I would suggest you either Serta air mattress with NeverFlat secondary pump or SoundAsleep Dream Series air mattress. How easy is it to inflate and deflate a mattress that you are about to buy? Yes, this is an important factor as battery pumps make inflation process more time consuming and are noisy as well. While foot or hand pumps are both time consuming and physically tiresome. Especially, at the end of the day when you are tired after a hectic schedule, spending time and effort just to inflate your air bed to its full size is in fact nightmarish. However, you can get rid-off this painful inflation process with Intex raised downy airbed. It has in-built high power electric pump that allows quick and hassle free inflation. It inflates the mattress to its full size of 22 inches well within 4 minutes. Our regular bed height is our comfort, right? But when we go camping we do adjust with low height air mattresses and that’s fine as we understand that we are outdoors. But while at home, low height mattresses are always uncomfortable. We move in and out of our bed multiple times in a day. However, bending our back and knees every time means putting more pressure on our spine and knee joints which isn't really a good sign. 18 inches height is a regular feature offered by every other traditional mattress, but Intex Raised Downy Air Mattress is the only mattress that adds additional 4 inches thus assuring exceptional convenience. Be it for kids or elderly people, 22 inches above the ground is a bliss. With in-built electric pump and less than 4 minutes of inflation/deflation time, this mattress is worth every penny that you spend. 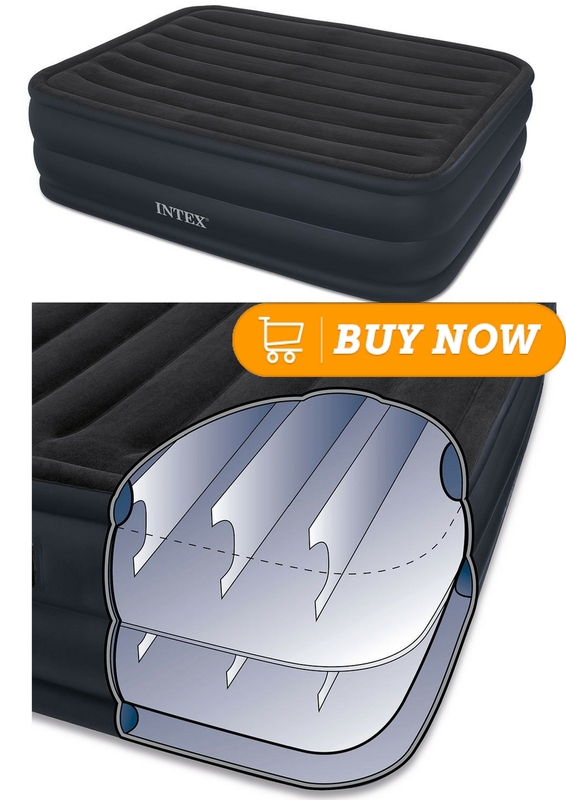 Intex Raised Downy Airbed is an investment, an asset and never an expense. It hurts when you spend your valuable money on buying a product and it doesn’t even last for few days. This is a common with low quality air mattresses. They start leaking air within few days as they develop cracks at seams. You can of course fix them but again it’s a tedious process that you wouldn’t want to do. Why take a chance with such mattresses? It’s rather better to buy something that’s proven on durability scale. Although other versions from Intex faced this problem initially but this particular version has remained immune to such silly issues. Its performance is top class otherwise it would not have sold in huge numbers, just look at the stats. Material used in the making of Intex raised downy airbed is of high quality. For example, the flocked top beams are made from 15 gauge vinyl and the side beams are again 16 gauge vinyl. The thickness is on the higher side and they can comfortably sustain ruggedness of any kind of surface. But it is always advised to double check the surface beneath before placing the mattress. With dual layer construction, the bottom layer has circular coils that function very similar to innerspring coils in traditional spring mattresses. But of course they don’t produce that annoying noise. Anyways, these circular coils hold the bottom and top surface of lower layer and provide flat and balanced sleeping surface without any bumps. The mattress has a sturdy construction that reduces chances of wear and tear. Indented sides help in keeping the sheets fitted from slipping. The package includes large size duffel carry bag for quick and easy storage. This is perhaps one prime area where the company lags behind its competitors. It arises with the difficulty in communicating with customer service as the company is based out of China. Minimum chances to find a replacement if you get a damaged version. It is always advised to check the mattress for any manufacturing defects at the time of delivery itself rather than opening it at much later date and ruing over it. In any case this mattress with record number of sales has relatively small proportion of complaints when to compared to other versions from the company. 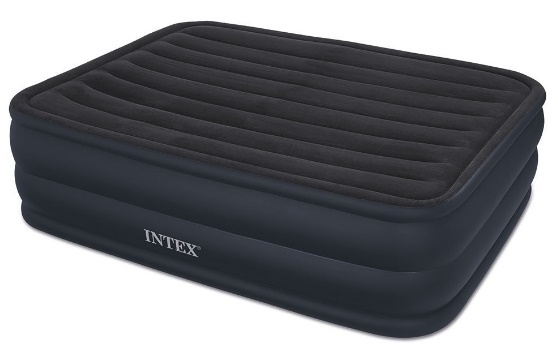 Final Say on Intex Raised Downy Airbed with Built-in Electric Pump, Queen, Bed Height 22"
Yet again I repeat, this is indeed best inexpensive option only if you want to own an air mattress as a backup sleeping option. With built-in electric pump, dual chamber construction and made from top quality vinyl construction, you can surely rely on Intex raised downy airbed when it comes to performance for the price. Height factor and the quick and easy 4 minute inflation/deflation is yet another reason why this mattress has such high sales numbers.